The Bill of Rights, added to the Constitution in 1791 as the first ten amendments, protects rights such as freedom of speech, freedom of the press, and the freedom to freely practice religion. The Constitution gives the government power; the Bill of Rights protects individual liberties. These two ideas have helped to make our Constitution the longest lasting of any nation in the world. The First Congress acknowledged that they needed to propose a set of amendments to give the people what they desired. Representative James Madison presented 19 proposals to the First Congress in 1789. His inspiration came from other documents that protected individual rights, particularly state constitutions and English documents–like the Magna Carta. He also included many of the changes sent in by the states during ratification. After much debate, Congress sent 12 amendments to the states for approval. Ten were ratified by the states and became known as our Bill of Rights on December 15, 1791. Rarely before did a people have the ability to peacefully adapt and adjust their government. Before our Constitution’s Article V, governments generally changed through war or violence, not votes. The Founders believed that the Constitution should be amended as the nation grew. Proposing an amendment is easy, but two-thirds of both houses of Congress and three-fourth of the states must approve the change before it is added to the Constitution. That is why, out of more than 11,000 attempts, only 27 have been successful. The Bill of Rights has a permanent home at the National Archives in Washington D.C. It is on display every day in a grand hall called the Rotunda for the Charters of Freedom. It sits beside the Declaration of Independence and the Constitution of the United States. The Dallas County Museum has a new pop-up exhibit from the National Archives, The Bill of Rights and You, commemorating the 225th anniversary of the ratification of this landmark document. The Bill of Rights and You spotlights one of the most remarkable periods in American history, explores the origins of the first ten amendments to the U.S. Constitution (collectively known as the Bill of Rights), illustrates how each amendment protects U.S. citizens and looks at how Americans exercise the rights outlined in the amendments. The Bill of Rights and You invites visitors to connect directly with the people, places, and events that mark this historic document’s evolution. This exhibit is on display in the Children’s Room at the Dallas County Museum in Fordyce. Chicot Trace Chapter Daughters of the American Revolution invites you to see it Tuesday – Friday from 10 a.m. to 4 p.m. or on Saturdays from 10 a.m. to 2 p.m. The Bill of Rights and You is organized by the National Archives and Records Administration and traveled by the National Archives Traveling Exhibits Service (NATES). 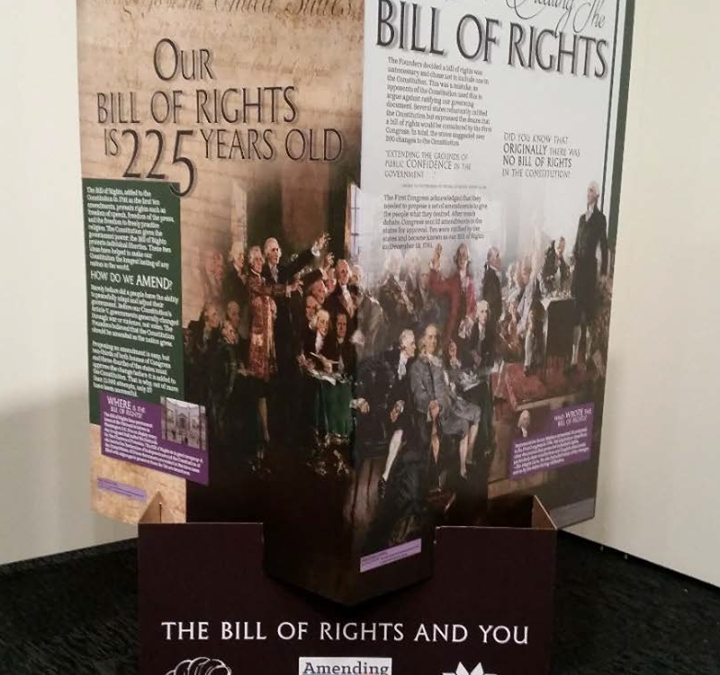 This exhibition was developed in collaboration with the National Archives’ National Outreach Initiative to commemorate the 225th Anniversary of the Bill of Rights. The exhibition is presented in part by AT&T, Seedlings Foundation, and the National Archives Foundation. This exhibit is brought to you in collaboration with the Arkansas Humanities Council and the Federation of State Humanities Councils.